A peek inside Skywalker Ranch, where the soundtrack for the "The Mars Generation" was mixed. Whether we're working with a brush stroke, a chord strum or a video timeline edit, creativity is the driving force for artists; I speak from experience, having been a video producer/editor and musician for the last several decades. 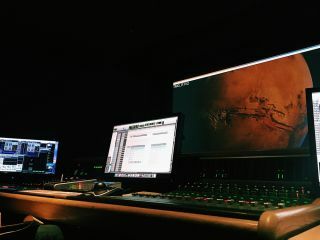 I've always been curious about the collaborative process musicians go through with film producers to create soundtracks that drive the emotion of the story, especially that of a space-related movie. Space.com: As a musician myself, I have an understanding of the songwriting process and how it differs from person to person, and genre to genre. For people who have never been part of the process, can you briefly explain how you go about composing music for a movie. Tyler Strickland: The first thing I do is meet with the director and editor of the film and we watch a rough cut of the film. We then talk about their dreams for the music and what they want to see come from the score. After that, we talk more about instrumentation, and I give suggestions maybe they haven't thought of before. Sometimes the films are edited using temp music, which I have to replace. Sometimes that's a good direction for the music in the film, but other times it's a bad direction. We go back and forth about where the music should be and where it shouldn't be until we have a good skeleton of what the music will end up looking like in the film. Then I go from there and go back to my studio and write for a week or two and come back with some music. From that point, we go back and forth on the tone of the music and if we have to make any adjustments on the instrumentation. Overall, it’s a very collaborative effort. Space.com: What are your thoughts on Mars exploration and the possibility of humans one day walking on the surface of the Red Planet? And how did that play into inspiring your compositions? Strickland: Well, I think we all know how imperative it is that we find a new home and Mars is by far our best shot. It's so exciting that this idea was once nothing more than science fiction, and today we have some of the greatest minds working day in and day out to get us there. A major part of the conversation between the director, Michael Barnett, and I, was that we wanted to use the music to inspire the audience to look at the possibility of living on Mars in the same way that the kids in our film are inspired. So for this reason, we took a very contemporary approach to the music. I kept thinking what would these kids be listening to and I doubt it would be orchestral music. So we took a very electronic and energetic approach to the score. I kept thinking throughout the process of scoring this film in 30 years or so what would astronauts be listening to while floating around in space. And it made sense to me that it would most likely be something electronic. So we used a lot of electronic music in the score. Musician Tyler Strickland recently composed the score for the documentary "The Mars Generation." Space.com: You've composed soundtracks for a wide range of topics. How does writing music for a space film compare to other films you've worked on? Strickland: I’ve been very fortunate to work on films with a wide variety of topics. I try to make a conscious effort of this and always work on something new — one of the many perks of working on documentaries. A lot of the films I score are documentaries, and most of them have very heavy subjects about social issues. Often, when writing music for a film like that, I have to be very conscious to avoid manipulating the true emotion of the scene or the subjects of the film. And one of the really exciting things about working on "The Mars Generation" was our director, Mike, told me to just run with it; to make it exciting, big and inspiring music. We didn't have too many conversations about the idea of manipulating or being sensitive to the material. There were a few scenes, which I won't go too far into, that were politically important that we had to be cautious with the music in, but much of the film required exciting, big music. And that's something I don't get to do as much in documentaries. So it was very exciting getting to do that. Space.com: How did you get involved with the film? And after this experience, is the space film genre something you want to reach into again? Strickland: Absolutely. It's a dream come true to work on a film about space, particularly a documentary about space. I’m not sure there's anything more important right now than educating ourselves about the state of our planet and thinking about the future. I’m thrilled that I was able to play a big role in inspiring the audience of this film to think about the importance of advancing space exploration. I think we made something very special with this film and if I was asked to continue that effort I absolutely would. It's a great film. It's a wild ride. I believe it's really going to be a film that resonates with all sorts of generations and a very wide audience. I think Netflix is the perfect home for this film, and I'm excited about the release. Kids of this generation will identify with the kids in this film, and the film asks many questions about how far we've come and how far we need to go, so I see older audiences resonating with it as well.